The Crowell & Moring International Trade Group advises companies with the increasingly complex maze of U.S. and international laws and regulations governing the movement of goods, services, and technology across national borders. We cover the waterfront – antidumping/countervailing duties, export controls, economic sanctions, anti-money laundering, customs, North American Free Trade Agreement (NAFTA), WTO, FTAs, the Agreement on Trade-Related Aspects of Intellectual Property Rights (TRIPS), anti-corruption/anti-bribery, investment, CFIUS, International Traffic in Arms Regulations (ITAR), Export Administration Regulations (EAR), section 337, 232, 201 and 301 proceedings, non-market economy cases, litigation, internal investigations, regulatory reviews, compliance management, due diligence, ethics, and more. With experience partnering with other practices – such as White Collar & Regulatory Enforcement, C&M International, Public Policy, Government Contracts, Intellectual Property, Advertising & Product Risk Management, Environmental & Natural Resources, Energy, Insurance/Reinsurance, Financial Services, and Corporate – we have the team in place to handle your issue, whatever it may be. Producers, importers, and exporters doing business in this dynamic regulatory environment rely on our lawyers in Washington, California, New York, Brussels, and London to provide advice on trade issues, and to facilitate communications with, and enhance access to, federal agencies. Significant Depth and Range. With more than 30 lawyers and trade professionals focusing on your international trade needs, we have among the broadest practices anywhere, supported by a world class, full-service law firm. We pride ourselves in providing prompt and practical guidance while staying agile to react to ever-evolving situations. Top-Tier Experience. A majority of our partners and counsel have individually practiced international trade law for over 15-20 years, giving clients access to over 150 years of collective experience. Policy Focus. Our trade lawyers team up with our affiliated trade policy specialists at C&M International to provide a unique and seamless approach to finding solutions for trade issues both in the U.S. and in overseas markets. Globally-Ranked. Chambers, Legal 500, and Best Lawyers all recognize Crowell & Moring’s international trade team. The International Trade Group has also been named to Law360′s “Practice Groups of the Year” list for 2015 and 2016. The annual awards recognize firms that came through for clients by sealing the biggest deals and securing wins in high-stakes litigation. Record of Achievement. We tackle trade remedies disputes and have a record of achievement for clients, including early exits (negative preliminaries, scope settlements, and more). Enforcement Experience. We have managed and successfully settled cases with the primary enforcement agencies in the trade area, including Customs and Border Protection (CBP), Office of Foreign Assets Control (OFAC), Financial Crimes Enforcement Network (FinCEN), Department of Justice (DOJ), Securities and Exchange Commission (SEC), Bureau of Industry and Security (BIS), Directorate of Defense Trade Controls (DDTC), and others. Litigation Avoided. Our best cases never reach trial when the government chooses a reasonable business resolution rather than litigation. Trial Experience. We have courtroom trial experience with international trade cases, including victories in customs valuation, Generalized System of Preferences, customs classification, customs penalty and NAFTA cases, and review of agency decisions in antidumping/countervailing cases before the U.S. Court of International Trade and the U.S. Court of Appeals for the Federal Circuit. Internal Investigations. Clients have sought our help in conducting and then defending criminal and civil investigations, during which we have handled complex privilege issues, massive document productions, and witness interviews to bring the investigations to a close. We regularly conduct investigations cross-border, leveraging our U.S., U.K., and EU experience to handle the substantive analysis while partnering with our Privacy & Cybersecurity colleagues to negotiate the nuanced data privacy challenges such investigations present. Fingertips Experience. We have recent and relevant experience from the most mainstream to the most arcane areas of international trade, from the antiboycott regulations, to arranging first sale transactions or determining whether antidumping scope requests or litigation at the CIT is warranted, giving you immediate and ready access to practical guidance without unnecessary time and cost spent in unneeded research. Agency Experience. We are well-known by the major and lesser-known agencies regulating international trade and IP matters. If you have any issue before one of the following agencies or any other agency with at-the border jurisdiction, we have been there… and know our way around. Trade 101. For many years, we have conducted specialized briefings for clients, including our Trade 101 program, a well-received half-day primer on the nuts and bolts of trade law for companies facing the challenge of globalization. Seminars with Clients. For significant issues and challenges, the International Trade Group develops and sponsors client-partnered seminars. Trade Regulatory Compliance Programs. We have extensive experience in designing and implementing international trade compliance programs for both multinational companies and small and medium-sized businesses. Market Access and Strategic Sourcing. Our FTA and tariff preference program specialists can help your company navigate the complex matrix of bilateral and regional FTAs and preference programs to identify new market opportunities, as well as increase your bottom line through strategic sourcing. International Intellectual Property Rights Risk Assessment. Our trade-related IP specialists can provide assistance in managing the exploitation and protection of your IP assets in the global marketplace. Secondment. Where appropriate, we partner with clients to provide our attorneys and trade analysts for temporary secondments. The Month in International Trade (TMIT) Newsletter. 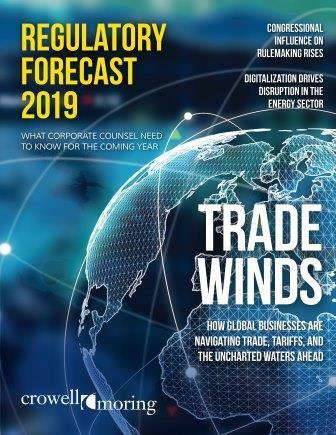 The International Trade Group highlights significant trade developments for clients via our International Trade newsletter (TMIT), which is distributed monthly. We represent major businesses – both public and private – in complex high-stakes litigation, enforcement, regulatory and administrative, and transactional matters, and government and internal investigations. Whether you need specialized counseling on structuring an international transaction, counseling and advocacy before international trade regulatory bodies, or representation in disputes with foreign parties, Crowell & Moring attorneys have the skill and experience to assist you. We pride ourselves on providing excellent legal service built on teamwork and responsiveness. If we can be of service to you, please contact our International Trade Chair, John Brew. For more on Crowell & Moring’s International Trade practice, please visit crowell.com/international-trade.